After a little bout with pyromania, Heather (Agnes Bruckner) is sent to a creepy boarding school in the middle of some even creepier woods. There, Heather makes some friends, but has a nightmare about one of them, Ann (Kathleen Mackey), being covered in blood. The next morning Heather discovers Ann was taken away for trying to commit suicide, but when Ann returns she claims she was taken into the woods by witches. Heather finds out that the boarding school may have once been the home of three red haired sisters who turned out to me murderous witches. Heather herself is a redhead and realizes she is being lured into the clutches of the mysterious forces that lurk outside in the dark woods. The Woods does a lot of things right, a nice traditionally spooky atmosphere, beautiful set design and a nice slow build to the horror. I appreciate that it does not overstate the fact that it is set in 1965, and it makes very reserved but satisfying use of Bruce Campbell. This is a film that didn’t really wow me on my initial viewing, but with subsequent ones, I find myself liking it more and more. 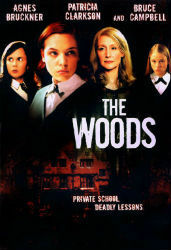 It lacks the bite and the emotion of McKee’s previous film, May (2002), and I think coming off of that, The Woods looks a little pale in comparison, even if it is technically much more accomplished. Considered on its own merits, it’s a thoughtful, and occasionally funny bit of horror cinema that should be more well-known.